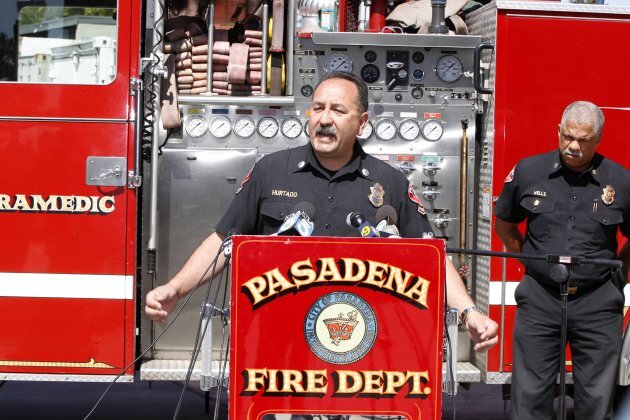 Associated Press - Art Hurtado, Pasadena Fire captain and paramedic takes questions during a news conference in Pasadena, Calif., Thursday, April 11, 2013. At right, Calvin Wells Pasadena Fire Chief. LOS ANGELES (AP) -- Fire Capt. Art Hurtado was making an off-duty visit to a home improvement store when he encountered a horrific sight — a man had deliberately cut his own arms to the bone with handsaws. As others screamed, the veteran paramedic used materials from store shelves to stanch the bleeding. "I kind of MacGyver-ed it," Hurtado said Thursday, referring to the old TV drama about a secret agent who used whatever materials he could find to solve problems. The incident occurred Wednesday inside a Home Depot Inc. store in West Covina, a suburb east of Los Angeles. The man was all by himself when he injured himself, West Covina police Cpl. Rudy Lopez said. The victim of the self-mutilation remained hospitalized as investigators tried to determine why he hurt himself. As of now, the incident is being investigated as an attempted suicide. The man, whose name wasn't released, underwent surgery and was in intensive care. Doctors were able to reattach his arms but will have to wait to see how effectively they were able to reconnect blood vessels and muscle as the man recovers, Lopez said. "We don't know anything about his history, motive, concerns at this point," Lopez said. Police declined to release the man's identity. Police said the man had grabbed several small saws, including one meant to cut drywall. He noticed police cars as he arrived. When officers pulled on medical gloves, Hurtado followed them into the store. "It's just mayhem in there," he recalled. 'Somebody's screaming in there as they're approaching the door that there's blood everywhere." Hurtado saw blood in several aisles and people running around hysterically. "It looks like a crime scene to me, a dead body," he said. "There's splatter everywhere, I'd say another 50, 75 feet of blood." Hurtado told the store manager that he was a paramedic, and he was allowed to move in. He and the officers flipped the man over. He was barely breathing and had no neck pulse. "I'm not on duty, I don't have all the equipment that I normally have," he said. The 21-year veteran called for quarter-inch rope and said he would have used his shoelaces if none was available. Somebody grabbed a package of rope from a store shelf. Hurtado had a police officer cut 24-inch sections and he used it and shop towels to make a tourniquet for one arm. The man started to come around, moaning, and arriving West Covina paramedics took over. He said the man had cut through nerves, tendons and arteries to the bone above both elbows. Without fast medical help, he could have died, Hurtado said. "It's just things you do instinctively. I'm here to serve," he said. "Any one of my brothers and sisters in the department would have done the same thing."